For a man who lived in a small country 2000 years ago and was in the public eye for only 3 years, Jesus of Nazareth has had an unparalleled impact on our world. Most of the globe even divides its history around the (approximate) year of his birth. The startling and unique claim of the Christian faith is that Jesus was (and is) fully God and fully man. Why do we believe Jesus was “fully God”? There are many reasons but the most telling is that Jesus came back from the dead and appeared to many witnesses. Nor was he half-dead but had a glorious new body; recognizable yet different. Jesus’ resurrection so empowered his followers that they literally risked everything to tell everyone the good news. Many were killed for their faith in “the risen Saviour”. The same is true today; around the world thousands of Christians suffer extreme persecution and even death. Why would they risk everything for Jesus? 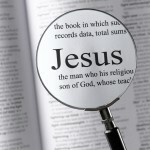 When we look closely at the evidence – the whole weight of his teaching, his works, his character, his fulfillment of Old Testament prophecy, his resurrection from the dead and the testimony of independent witnesses – Christians are convinced that this is the strongest possible proof to support Jesus’ claims to be fully God and fully man. All of them are united in their common experience of a personal relationship with the risen Lord Jesus Christ. Having found the true meaning of life, it is the most natural thing to share that good news with other people. So what will YOU make of this God-man? Throughout the course of his public ministry, Jesus knew both the adoration and desertion of the crowds. If we investigate Jesus’ claims and consider carefully the evidence available to us, we need to think again about how we respond to Jesus and his teaching. Today, just as 2,000 years ago, the gospel asks a question that demands an answer: Will YOU follow Jesus?